Psychedelic Jazz Rock debut album featuring inventive guitar solos and jazzy piano riffs. These three young songwriters each bring their unique styles to this musical collaboration. The band began with brothers Scott and Bill Nisley working as a duo under the name, “Boulevard Brothers” with Scott on keyboard and Bill on guitar. The two penned more than 16 songs between them and recorded two CDs before joining forces with Adam Sherman who had been refining his virtuoso guitar riffs for the previous six years and writing songs of his own. Zack Belka joined the group with his driving drum rhythms and the 45’s were born. 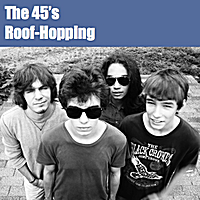 “Roof-Hopping” showcases the unique sensibilities of each of its three songwriters: Scott’s jazz-infused keyboards and vocals; Adam’s psychedelic guitar anthems against his in-your-face vocals, and Bill’s alternative rock songs. The boys show their versatility with Scott playing both keyboard and bass while Bill, the youngest member of the band at only 14 when the album was recorded, moves from drums on two of the tracks to guitar on the title track. Adam’s unique guitar solos grace six of the seven tracks with dual guitar lines woven together on “Miss Intruder” in an inspired harmony and artistry that hint at what this band is capable of. In the Zeppelin Song, the band spreads out into a controlled jam with an infectious groove. The jazz influence is clearly felt on “Make Her Mine”, a tune that invokes the keyboard sounds of The Doors. Scott’s rhythms come to full fruition on “Speakeasy”, the jazziest song on the album with a danceable beat that is irresistible.